Awe Struck of Genesis (AHR 31045-09) was born on April 24, 2009. 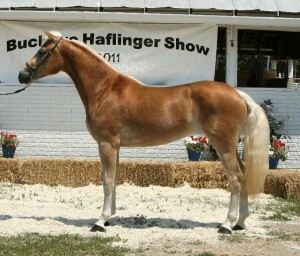 She is sired by our imported, AHR Gold Classified and 3-time AHR National Champion Stallion Alfa of Genesis. Her dam is the great producing broodmare, Amina NTF. Amina NTF (better known as Amy) is sired by Afghan III and out of a Winterstein dam. She has produced many show winners and sale toppers through the years. Her offspring have gone on to have notorious careers and be great producers themselves. Some of Amina’s famous offspring include: Major Attaction KH, Major League II KH, and Amelia KH. Naming this filly “Awe Struck” was a simple task. We expected that the combination of Alfa and Amy’s genetics would produce an exceptional individual. But, when Awe Struck was born, we were truly awe-struck by her appearance. This filly’s sheer presence, balanced confirmation and breath-taking movement combined together to create a filly that you could hardly take your eyes off of. For the first few days of her life, Awe Stuck was known as just that: “Awe Struck!” But then her bright, cherry red color soon led to her nickname that she is now better known as: “Cherry.” This girl is as red as a cherry and just as sweet! Cherry is the result of Alfa’s very first foal crop. In 2009, there were only about 10 Alfa offspring in the entire country. However, they didn’t waste any time in claiming their share of awards and titles for themselves! Cherry was not weaned from her dam in time to be shown at the 2009 AHR National Show. So, Cherry’s first show ring debut was at the 2009 AHR Futurity. Cherry won 2nd place in the competitive Junior Weanling Pleasure Filly class (the class was actually won by her pasture-mate, Limelight of Genesis). She also competed in the AHR Stallion Incentive Program’s (SIP) Pleasure Class against 26 other eligible foals and came out of the class with the 4th place ribbon. Her 4th place finish in this large class helped contribute to earning her sire, Alfa of Genesis, the AHR Reserve Stallion of the Year title based on the performance of his offspring at the 2009 AHR Futurity. Cherry was not shown again until the 2010 AHR Futurity, at which show she received 2nd place in the yearling filly class. In 2011, Cherry brought home her share of blue ribbons and titles. 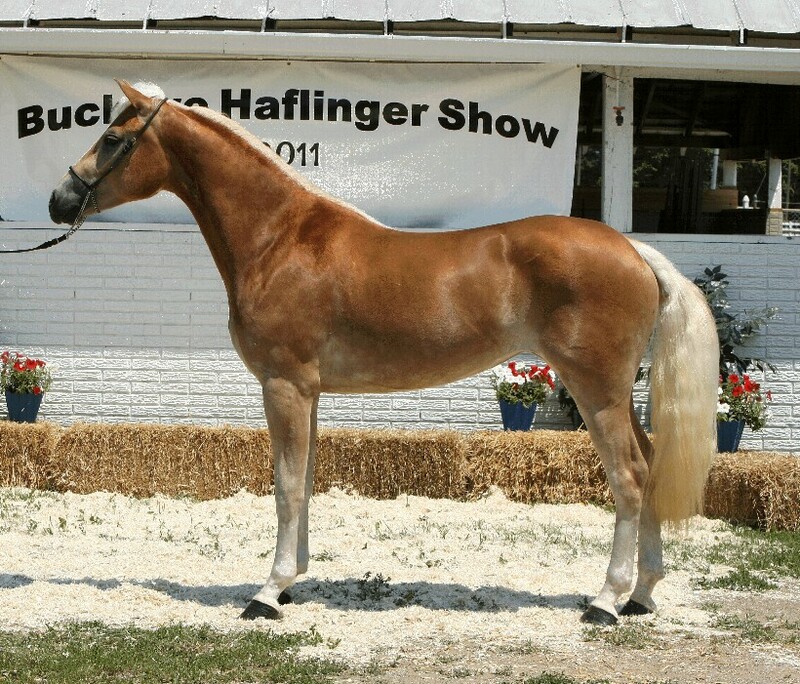 First, she won her 2-year-old filly halter class in July at the Buckeye Haflinger Show. Then, she won her 2-year-old filly class under both judges at the New York Gold Classic later that month, going on to be named Reserve Junior Champion of the show under both judges! Also, that same show weekend, she was AHR Silver classified with 79 points! Finally, in September, she won the 2-year-old filly class at the AHR National Show and went on to be named 2011 AHR Reserve Junior National Champion Filly. She was only beat out for the Junior National Champion title by her yearling half-sister, Aura of Genesis. Together, at the National Show, Aura and Cherry teamed up and competed in the National Produce of Dam class as Junior National Champion and Reserve Junior National Champion fillies, these dueling sisters easily won that class in their mother’s honor! September 2011: Cherry was the 1st place 2-year-old filly at the 2011 AHR National Show and went on to be named the ‘2011 AHR Reserve Junior National Champion Filly’. This was only defeated for the honor of ‘Junior National Champion’ by her half-sister, Aura of Genesis! These same two powerful filly-forces combined together to win the 2011 National ‘Produce of Dam’ class in their dam’s honor!